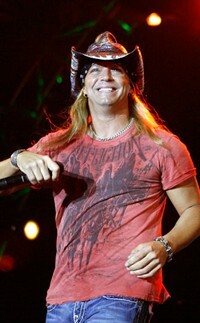 Here’s hoping this positive Bret Michaels news is something to believe in. A week after suffering a brain hemorrhage likely caused by a ruptured blood vessel, the hospitalized rocker is responding well to tests and treatment, and doctors are still hoping that the 47-year-old father of two will make a full recovery. “We thank you all for your continued support and outpouring of well wishes for Bret,” read a message posted Wednesday on Michaels’ official website. Michaels’ camp is also awfully optimistic about just how fast the rocker will be not only back on his feet, but back onstage. Michaels is looking to resume his Roses & Thorns tour May 26, “provided there are no further complications or setbacks,” in Ft. Smith, Ark., and his people are in the process of rescheduling all of the missed shows between Michaels’ hospitalization and then. A tour with Lynyrd Skynyrd in June and July is also supposedly still on. The statement still referred to test results indicating Michaels is suffering from a seizure-causing sodium deficiency as a “minor setback.” There has been no word on whether Michaels, who has Type 1 diabetes, has had any seizures since being diagnosed. E! News reported last night that the Arizona resident is currently receiving treatment at the Barrow Neurological Institute at St. Joseph’s Hospital and Medical Center in Phoenix.